the conflict between the German imperial government and the Roman Catholic Church from 1872 or 1873 until 1886, chiefly over the control of education and ecclesiastical appointments. The Lyric Opera of Chicago is presenting Engelbert Humperdink’s (the original Humperdink, not the pop singer) Hansel und Gretel. As you’d expect the music was heavenly and the story was compelling. This version emphasized the hunger and poverty this family experienced. The first act portrays how this family has no food other than a small jug of milk, probably 2 cups full, hardly enough for a family of four. The children lament how they’re starving and long for food. During the pre-opera lecture, we were reminded that before a neighbor gave Hansel and Gretel‘s family the milk, the probably hadn’t eaten breakfast or dinner the night before. Yet when they get rambunctious and are cavorting around the kitchen they break the milk jug losing the only food the family has. The mother returns and is furious when she learns that the milk’s gone. She sends Hansel and Gretel into the forest to get a large bowl full of berries. After they leave, their father returns and fortunately, he’s sold all his goods, the brooms he makes, and has bought a large bag of food. Their problems are over. When father learns that the children are off in the woods, he’s alarmed. The forest is dangerous. A terrible witch who preys on children lives there. What was mother thinking? The second act is set in the forest, done with a minimal naturalistic style, with dark, foreboding visuals. Again the music is moving and the visuals compel. The highlight of the act was when the children say their prayers singing to the 14 angels who protect them. Opera newcomers would appreciate this performance as the story is so familiar and the music is beautifully sung. There are some differences from the cozier versions of the story we usually hear. The mother is not a stepmother. The scenes with the bread crumbs aren’t here and we don’t see a colorful candy house. So the artistry of the sets isn’t what you’d expect, but the visuals do express the theme of hunger and hard times well. 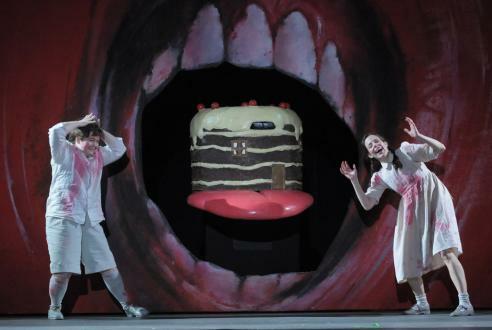 All in all, this production of Hansel und Gretel pulls us in from start to finish. 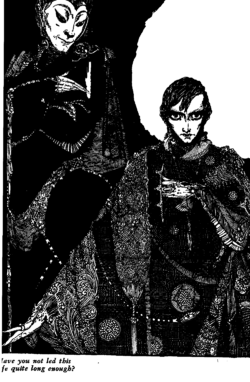 My online book club’s October pick was Faust, Part 1 by Goethe. While I liked the poetry of the play, I found it made me read too fast. The rhythm pulled me swiftly along, and pages would go by, before I realized I hadn’t remembered what had happened. Faust is the legendary story of a scholar who sells his soul to the devil in exchange for success in this life. The bargain soon turns out to be horrid. Faust gets to seduce Margaret (sometimes called Gretchen), but she gets pregnant and since she lives in a society that will exact punishment for that transgression, she drowns the baby. Every favor turns out horrible for Faust. I read that Goethe was influenced in part by the Book of Job. He takes the bet between Satan and God in a different direction, but it’s quite dramatic. The play ventures into that dark realm that’s I’d say next door to the horror genre, a genre I don’t like at all. So I found the play masterfully written, but I didn’t get into the story and doubt I’d return to it. Still it is worth reading.